Community management is the common model for rural water supply, but it has limitations, particularly when it comes to the ability to sustain services over the long-term. In an effort to identify what works and what doesn't when it comes to community management, the Community Water Plus project is investigating successful community-managed rural water supply programmes and approaches across India. The project is funded by Australian Aid and is being implemented by a consortium of partners, including: the Administrative Staff College of India (ASCI), the Centre of Excellence for Change (CEC), Malaviya National Institute of Technology (MNIT), the Xavier Institute of Social Service (XISS) and IRC with overall project coordination provided by Cranfield University. It is also working closely with national and State government agencies as well as civil society partners. Community management has long been recognised to be critical for rural water supply services delivery. Indeed, community management has contributed significantly to improvements in rural water supplies. However those supplies are only sustainable when communities receive appropriate levels of support from government and other entities in their service delivery tasks. Communities may need easy access to on-demand technical staff from government entities, they may need support from civil society organisations to renew their management structures, and they may need to professionalise, that is outsource certain tasks to specialised individuals or enterprises. These components are the ‘plus’ – the necessary add-ons of community water supply. Without such support, community management rarely performs well at scale and is then not an appropriate model for sustainable services. In spite of the existence of success stories in community management, and a range of good practices, mechanisms for support and professionalisation have not yet been scaled-up in policies and strategies, leaving these success stories as islands. One possible reason for this widespread gap in community management is that the necessary support comes at a price, and sometimes a significant one. Support does cost governments and donors additional resources in the short-term, but it is likely to deliver better and more sustainable services in the long term. A scoping study to understand the range of best practices in community management across India, taking note of the range of scale and entities involved. 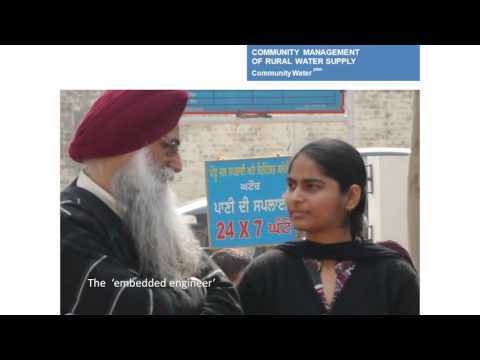 The level of community management- we start from the premise that community empowerment is an important feature in itself, and that the degree to which communities are managing their own services is a reflection of that empowerment. Service levels- what ultimately determines success is the level of service, understood to mean the quantity, quality, reliability and accessibility of the water that users get, and the degree of equity. Performance of the service provider- community-based organisations are fulfilling functions of a service provider, particularly operation and maintenance and administration. This summary paper introduces the concepts and methods of the Community Water Plus project. A four-page brochure explaining the India Community Water Plus Project. We were here to find out what the water committee does about water supplies, but only a local government official was around to explain it all.